Famous Muslim Brotherhood alumni include a plethora of international terrorists, including Islamic State leader Abu Bakr al Baghdadi and deceased Al Qaeda mastermind Osama bin Laden. Many Muslim Brotherhood members also happen to be anti-Semites, due to the jihadist group’s founding political ideology, which calls for particular hostility towards Jews. The Huffington Post Arabic editor-in-chief is no exception to the commonly-found parallel. Fouda tweeted last July, “Only after the latest Israeli aggression on Gaza did I realize the number of Egyptian Jews has increased greatly since the coup.” The Tweet is still displayed in Fouda’s Twitter feed. And reports have documented that under its new leadership, Huffington Post Arabic is displaying the political ideology of those in charge of its editorial operations. In less than a month since its initial launch, Arianna Huffington’s new Arabic venture has shown a knack for showing hostility to LGBT people and women. 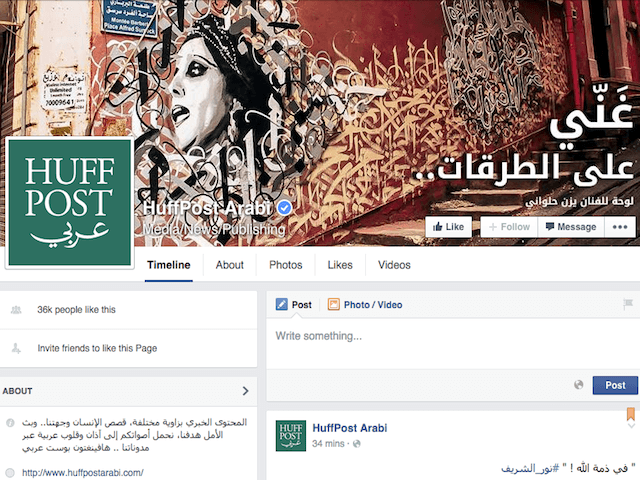 Since its July launch, Huffington Post Arabic has failed to live up to its “progressive” and “liberal” values, some have observed. In one article, a contributor used a derogatory Arabic term to describe homosexuals. In the piece, a columnist warned that the government is allowing “a press conference for gays in the heart of Cairo,” while using rhetoric typically applied by the Muslim brotherhood to highlight the supposed collusion between the government and secular forces against Islam in Egypt. On July 28, the site conducted a feature interview with a former spokesperson for the Egyptian Brotherhood. And on Sunday, the site led with a piece concluding that the Brotherhood will retain its “peaceful” and “revolutionary approach” to fighting against the current government in Egypt. However, Egyptian officials beg to differ. Cairo’s current President, Abdel Fattah el-Sisi, has described the Brotherhood as the “Godfather” of global terrorism, citing the group’s own ideology, which calls for Islam to dominate the world.